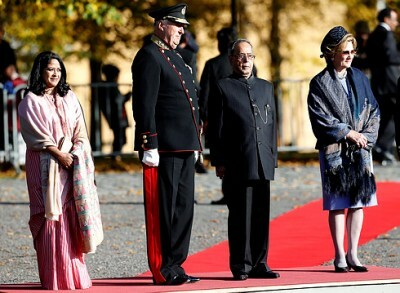 The canons fired from Oslo’s Akershus Fortress promptly at 10am Monday as King Harald received the president of India for the first state visit of an Indian head of state in Norway. The day was filled with the usual ceremony and ended with a gala banquet at the Royal Palace. Exactly 193 guests were expected at the banquet, including some from the large business delegation from India who are traveling with President Pranab Mukherjee. They also attended a large conference on Monday, at which Norwegian businesses were encouraged to invest in Indian projects, from roads to high-tech ventures. Mukherjee would also like to see more investment in India by Norway’s huge sovereign wealth fund, better known as the “oil fund,” but one Indian businessman admitted that Indian business “may have spoiled things for themselves” because of the country’s widespread use of child labour in India. Norway’s oil fund must comply with strict investment standards, and Norwegian companies are also prevented from getting involved with child labour. Mukherjee’s visit comes just two days after Indian child advocate Kailash Satyarthi won the Nobel Peace Prize along with 17-year-old Malala Yousafzai of Pakistan, who advocates education for all children, especially girls. Monday’s program included a royal welcome on the grounds of the palace, a traditional wreath-laying at the national monument to fallen soldiers during World War II, and visits to the Parliament, Oslo City Hall and Oslo’s Fram Museum, which tells Norway’s history of polar exploration. The visit was to continue through Tuesday, with the president and the king attending the business seminar along with visits to the Museum of Applied arts, The Norwegian Opera and Ballet, a government luncheon at Akershus Castle and an afternoon visit to the Munch Museum.